Alliance Films is a major Canadian motion picture distribution/production company, which serves Canada, the United Kingdom, and Spain. Working in an agency capacity Seventyeight Digital provides a broad range of design, development and technical services in support of Alliance's ongoing marketing efforts for their feature film and DVD releases. These services include consumer data management, email marketing, contesting, post screening survey data collection, event management support services, and print design. The following provides a brief overview of some of these key services. Seventyeight stores and manages a centralized relational database of all Alliance's consumer subscriber data. This database is used to target marketing initiatives based on demographics and consumer behaviors. Seventyeight developed webservices that allow all Alliance partner agencies to feed newly acquired consumer data into the centralized store in real-time. Initially Seventyeight was tasked with consolidating all of Alliance Film's consumer subscriber data sources into a single normalized relational database providing a sustainable data structure and effective validation checks to ensure and maintain data integrity going forward. In short, our task was to provide Alliance with a sustainable, centralized subscriber database that can effectively target messaging and gain strategic insights into their subscriber base. Seventyeight performed the following extensive data cleansing, transformation and normalization processes in order to consolidate, enhance and optimize the subscriber data. Dozens of separate and uniquely structured subscriber lists were analyzed and then put through an initial cleansing process to remove any obvious erroneous data. A master schema was then developed based upon both what was most common among all data sources and what would be most useful going forward. The schema is extensible so future needs can be accommodated easily. The data sources were then normalized around the master data schema - consolidating the data sources around this standard format required a series of transformations to structurally affect the data. We then imported all the data into a SQL Server database so more intensive and powerful operations could be completed upon it to further increase its usefulness - with particular focus on maximizing the demographic data points. Finally we completed a "duplicate data merge" designed to eliminate duplicate subscriber records while ensuring no information was lost - this required identifying the most recent and accurate data across all instances of that subscriber and merging these into a single contact record. All of this effort resulted in a centralized dataset of subscribers containing a high percentage of demographic attributes that can be used to effectively target marketing initiatives. Seventyeight Digital leverages the centralized subscriber database to send out targeting email messaging as part of an integrated campaign incorporating social media, contesting and print tactics to build buzz and awareness for upcoming film releases - extending the overall reach of traditional marketing tactics. Design & Implementation - We create full HTML email designs that ensure efficient creation of messaging and compliance with email client formatting and layout limitations. Audience Segmentation - Seventyeight configures a targeted send list based on specific demographic criteria defined by Alliance Films and aligned with the films particular audience differentiators. Testing and QA - Prior to sending we employ a series of quality checks and test cycles including spam filter analysis, email client testing and client acceptance testing. Delivery - Seventyeight will schedule delivery of messages to arrive at a specifically specified date/time designed to generate the greatest recipient response. Reporting - Following each campaign a comprehensive performance report providing key metrics is generated and reviewed against previous campaign results and industry benchmarks. Alliance Film's has used Seventyeight Digital's proprietary contest engine to run over 200 contests. 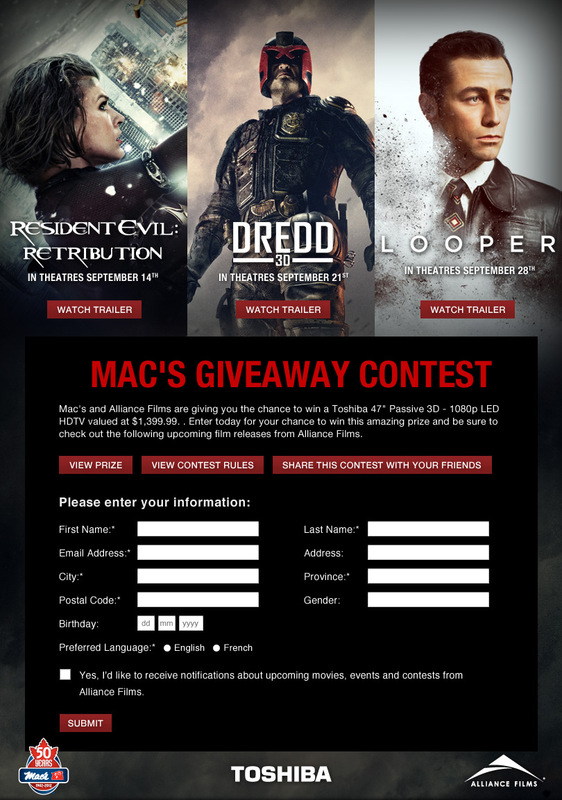 These contests are key drivers in the effort to build consumer awareness around feature film releases. The contests are highly interactive and deployed across various platforms including social media (facebook, twitter) microsites, etc. Social sharing is incorporated to help extend the reach of these promotions. Contest range from simple challenge questions, to photo/video submissions with voting and commenting, to multi-stage contests. The Seventyeight Contest Engine provides full automation around contest implementation, entry data management and validation, security and auditing, and drawing of contest winners.